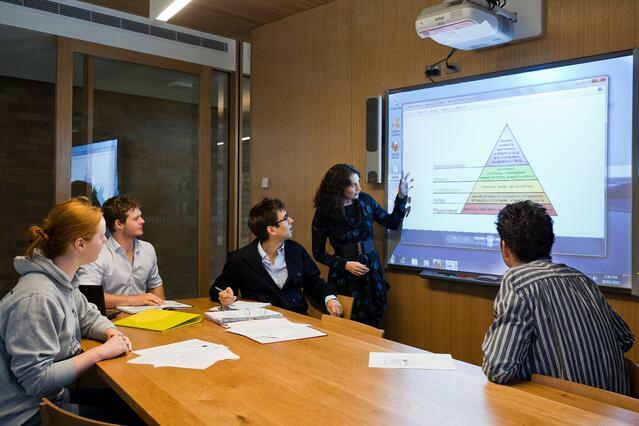 Trinity College (an affiliate of the University of Melbourne) uses lecture capture and active learning strategies and technology to encourage participation and engagement for international students, including many non-native English speakers. The Trinity College Foundation Studies program was founded over 25 years ago to bridge the gap between high school and university study, and provides a pathway to prepare students for entry into the University. Today, almost 50% of the University’s on campus international undergraduate students come through the Trinity Foundation program. We recently caught up with Dr. Jennifer Mitchell, Literature Lecturer and eLearning Coordinator for Trinity College, to hear about how they are improving the student experience with active learning and Echo360 technology. What were some of the challenges you were looking to address with technology in your classrooms? All the students in our program are international, mainly from China and South East Asia, and most have English as a second language. Therefore, our primary challenge to overcome was to support second language student learning, to enable revision and reflection on course materials: and at a minimum to replicate the university environment our students would eventually encounter upon graduation from our program. Lecture capture helps us meet this need for students. For several years prior to using Echo360 technology, some of our instructors recorded lectures using audio-only tools, posting the files on our LMS for students to access. Feedback on this resource from students was very positive. However, we were searching for a tool that would streamline the process for both students and instructors across our program, while also linking audio to slides and other visual materials. In 2014, we selected Echo360 to provide this functionality across the program. More recently, we realized we needed to find new ways to actively engage students within the lecture format: a challenge common in lecture groups with large numbers of students. Adding to this challenge was our oft-observed experience (over the twenty-five years of our program) that international students can be hesitant to voice their thoughts and ideas within small, let alone large groups. Enabling a means for students to engage in Q&A activities, short quizzes, and ‘voting’ through their digital devices was definitely an attractive proposition. Not only does Echo360 provide technology for lecture capture, but it also provides a channel for students to participate in lectures through interacting with live presentations. Students can participate in activities like polling, ask questions anonymously, and take time-synched, contextual notes. With Echo360, there is an inbuilt scope for evolving more flexible and stimulating means of student engagement before and after lectures. What impact have you seen thus far among students, instructors and the institution as a whole? We have approximately 50 instructors using the Echo360 system across most courses. While it is still early days in the deployment of the active learning capabilities, the response thus far has been very positive. Instructors find using the system straightforward, and students can easily access presentations and participate in activities. Overall, both students and staff are finding the potential for more engaging and interactive lectures exciting, particularly as it is so simple to add media, quizzes, and other activities which stimulate thinking and can even facilitate small group collaboration within the often restrictive lecture-oriented learning space. It has motivated instructors to substantially rethink and redevelop their lecture formats and materials which is not a bad thing. Students are also starting to request (and expect) more interactive and engaging lecture experiences. How are instructors using the data to support their instruction? Overall I would say that the level of engagement has increased. Having access to analytics to gauge student participation and interactions provides us with rich data that was previously unattainable – and instructors are excited by the potential this offers. We expect to see engagement levels increase going forward. In addition, as attendance at lecture is compulsory for Foundation Studies Students, simply being there is not one of the measures of student success. However, numbers of students interacting with activities and quizzes in real time is definitely something that enables lecturers to reflect on student’s interest levels and to adjust speed, or complexity of material. With most of our students being learners in a second language, the speed and consistency with which they participate in Q and A tasks, or respond with short answers to presented problems can provide very useful feedback for designing instruction. What advice would you give to others looking to implement a similar solution? I think for a larger tertiary institution, deploying Echo360 for lecture capture makes sense, as students expect reliable access to online lecture recording. Taking full advantage of the active learning capabilities does, I believe, require a coordinated and thoughtful design solution for each subject area, with evaluation and student feedback built-in to promote continuous improvement, and fresh approaches. Having the platform hosted offsite (in the cloud) and thus always available and free from local technical issues is definitely a huge bonus for us. The technical issues with deployment were minor, and the system is running smoothly and consistently. Even if your environment is non-standard and challenging, there are solutions for you. Moving forward, what’s next for your institution? Trinity will continue to further develop the learning-design skills of our instructors to deliver more engaging and interactive lectures for our diverse student groups. We would also like to begin using additional resources and capabilities of Echo 360 across all the different areas of the College, including enabling remote access to live events.